Over the years, home elevators have become increasingly popular; however, some homeowners have not been able to install elevators due to a serious lack of space. A traditional elevator shaft takes up to 25 square feet on each floor. This can make it easy to believe why those with smaller homes simply couldn't install a traditional elevator. Thankfully, the pneumatic elevator has solved this space problem once and for all, and now small homes can feature pneumatic elevators and homeowners can still enjoy plenty of living space. The initial problem with home elevators was, obviously, space. A traditional elevator needs at least 25 square feet per floor to be installed, and most homeowners don't have that extra space to sacrifice. Traditional elevators also require a pit and machine room, both of which are not exactly easy to install. Significant construction is required for retrofitting a home with an elevator, and that alone can deter many homeowners from actually going through with the project. Pneumatic elevators function by utilizing a vacuum. By creating a vacuum above the elevator car, air pressure from below the car literally pushes the car upward. To bring the car back down, the vacuum is decreased, and the car begins to descend. This simple means of ascending and descending the elevator car via vacuum requires no cables, oils, or gear boxes. Pneumatic elevators take up less space. Since there are no moving parts, no machine room is needed. Since cables or gear boxes are not necessary, you also don't need to dig a pit in your home in order to install a pneumatic elevator. Pneumatic elevators only need nine square feet per floor instead of 23. The tube is easy to install and doesn't require heavy construction. Quick installation, low maintenance, and plenty of remaining living space are the benefits of pneumatic elevators. No solid walls. As a perk, pneumatic elevators won't make a room look overcrowded or cramped, since they don't feature any solid walls. 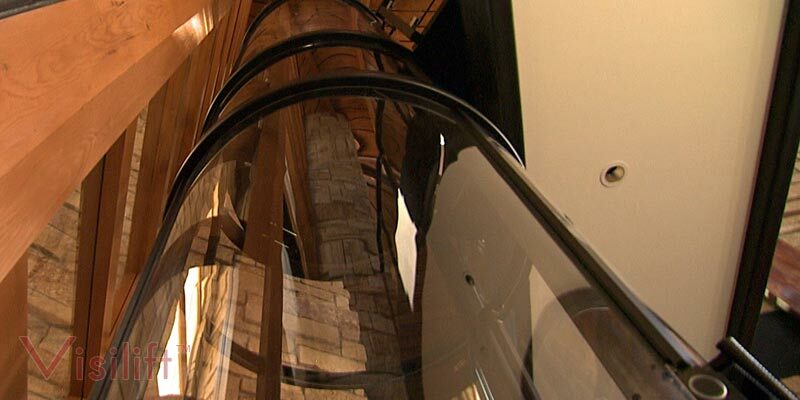 The tube of a pneumatic elevator is made entirely of glass or plastic, so that the rider has a 360-degree view of the home while riding. This see-through features makes a room with the pneumatic elevator appear even larger.